Another significant announcement made by Disney at their D23 Expo was a confirmation to rumors that director Robert Zemeckis would be writing and directing a remake of The Beatles’ 1968 animated movie, Yellow Submarine. The 1968 cartoon followed the legendary band as they traveled via the bright-colored submarine to Pepperland, a beautiful world inhabited by friendly, music-loving people that has tragically been taken over by the music-hating Blue Meanies, who have frozen all who live there and destroyed all of the beauty and music. The Beatles are employed to help out and use their music try and take Pepperland back and bring joy to the people once again. 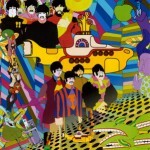 Yellow Submarine certainly has to be in the discussion of the most trippy movies ever made. Instead of the cartoon style they used in ’68, this new version will be in true Robert Zemeckis stylem using the motion-capture technology that he’s found so much success with in previous movies like The Polar Express and Beowulf, as well as the upcoming A Christmas Carol. He’ll also be using all of the amazing Beatles music that was featured in the original, including “All Together Now,” “All You Need Is Love,” “Eleanor Rigby,” “Lucy in the Sky with Diamonds” and “With A Little Help From My Friends”. Yellow Submarine’ is one of the greatest fantasy films of all time, and making this new 3D performance capture movie is a dream come true for me. With the latest advances in technology, we will be able to take moviegoers on a voyage unlike any other, and bring new excitement and dimension to Pepperland and the various sea worlds they encounter. I’m thrilled to be working with the good folks at Apple Corps and our partners at Disney on this epic retelling of one of my all time favorite films. Before becoming the man who has almost single-handedly taken on the motion capture technology and presented it to us the fans, Robert Zemeckis was responsible for some of the most-cherished films of all time. His resume includes Back to the Future, Who Framed Roger Rabbit, and Forrest Gump. He also directed 1978’s I Wanna Hold Your Hand, which follows six young girls who are complete Beatle fanatics and set off on a quest to get into the very first Beatles concert in America. This shows that the man also has a passion for the band that will surely shine through in Yellow Submarine. One can now only wonder, having tragically lost two of the band’s members over the years, how does the director approach this motion capture project? Guillermo del Toro & Walt Disney Team Up For Scary Animated Adventures!